Team “7” Racing welcomes Vision Wheel® as a new associate sponsor for their world motorcycle speed record attempt with award-winning driver Valerie Thompson. Team “7” will attempt making Thompson the fastest motorcycle racer in the world by breaking the current record of 367.363 mph at the Bonneville Motorcycle Speed Trials competition August 27 – September 1, 2017 in Wendover Utah. “We are delighted to have world class racers like Valerie and Team “7” Racing represent our world-class products,” said Roger Minor, founder and CEO of Vision Wheel. “I’ve watched Valerie’s career over the years and she’s a winner, both on and off the track. We look forward to sharing in her success,” added Minor. “As an independent team owner, I look for value and reliability in everything I buy, whether its racing equipment or trailer tires. That’s why I’ve used Vision Wheel products for years,” said Thompson. “Without Vision Wheel tires, wheels and accessories, we’d never get our equipment to the track. All our support equipment, ranging from tow vehicle tires to our golf cart wheels roll on the best-in-class products provided by Vision Wheel,” added Thompson. Team “7” Racing owners John Jans and Joe Harralson will continue utilizing the talents of Motorcycle Hall of Fame member, designer and team leader, Denis Manning. The Manning designed and American built “7” Streamliner held the motorcycle speed record from 2006 to 2008 (350.884 mph) and again from 2009 to 2010 (367.382 mph). 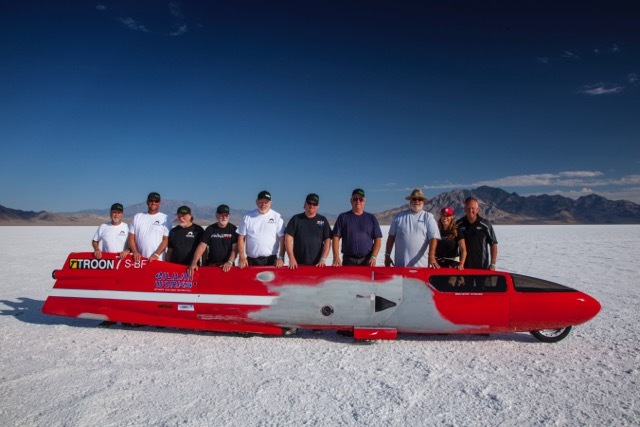 Piloting the Team “7” Racing Streamliner, Valerie created racing history at the 2016 Bonneville Motorcycle Speed Trials, earning the “The Fastest Time of the Meet” award with a speed of 304.263 mph (489.6 KMH). Valerie is the first female rider over 300 mph, earning the title of “Worlds Fastest Female Motorcycle Racer.” A seven-time land speed record holder and team owner/driver, she fields her BMW S 1000 RR in select land speed competitions. Valerie has earned membership in six different 200 MPH Clubs and is a lifetime member of the famed Bonneville 200 MPH Club. In 2017, she became the first female appointed to the Bonneville 200 MPH Club Board of Directors. Valerie recently formed her independent drag racing team to compete in the 2017 NHRA Pro Stock Motorcycle series. Her many racing accomplishments have earned Valerie the moniker of “America’s Queen of Speed” by the worldwide press. Discerning drivers want only the best for their vehicles, and with over 40 years of experience, Vision Wheel delivers. With a stunning line of custom wheels for your truck, SUV, passenger car as well as UTV’s and ATV’s, Vision Wheel provides auto enthusiasts with the highest quality products available. Strength, style, endurance and excellence are all qualities that drivers have come to expect from Vision Wheel. Attractive looks and consistent performance are trademarks of every Vision Wheel that are sure to enhance any vehicle.